Franklin Park Villa Co-op in Jamaica Plain is nestled in the Emerald Necklace near Franklin Park. It is country living in the city at its finest. This 3-story, 62 unit senior cooperative offers the freedom and enjoyment that comes with independent living for those aged 62 and older. The property was completed in 2002. 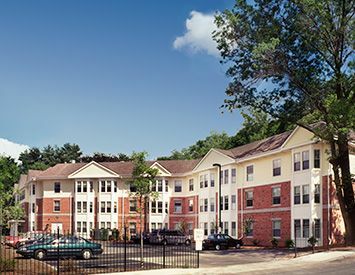 Franklin Park Villa is nationally recognized as “A Community of Quality” by the National Affordable Housing Management Association. Franklin Park Villa has come to be a healthier and safer environment to live in by becoming 100% smoke free. Smoking is not allowed within the individual apartments, the common areas, and within 25 feet of the building. The members of the co-op are able to enjoy the peace and privacy of their own apartments or they are welcome to participate in many activities held in the co-op by different committees. You can be a part of one committee or as many as you want. Some of the committees include: entertainment, gardening, parking, kitchen and leasing, to name a few. There are occasional catered events and many other possibilities to be part of a large family where the motto is “Working together to help each other”. Franklin Park Villa is conveniently located within 1 mile of the Forest Hill MBTA station and there is a bus stop right in front of the building. The Arnold Arboretum located less than 2 miles from the building is a great place to walk and to learn about all the different trees around the world. Franklin Park Villa is affordable for everyone. Every unit has subsidy and members pay only 30% of their income for rent. Please come and be part of this great family!